We have members of our community approach us at St. Margaret's requesting our assistance for food to tide them over until the end of the month or until they can get appointments with other organizations. We want to assist those in our community who are in immediate need of food. We are asking that you consider bringing just one or two items: canned goods, tea, instant coffee, cereal, peanut free snacks, etc. to church each month to assist. That way we can have a supply on hand to help those who are in desperate need. We know the present situation is challenging for most families but anything our congregation can do to improve life for those most seriously in need will be greatly appreciated. Thank you for your assistance with this initiative. We will still have our Food Bank program running on the first Sunday of the month. We are looking for new members to join our casserole team. Men and women are all welcome to join in to help with this Ministry. We provide casseroles for families in our parish who are having difficulty with illness or treatments, etc. and need a warm meal prepared for them occasionally. A casserole once a month is what we anticipate. If you would like to help, please contact Margaret Paradis, the church office or sign up on the sheet in the narthex. If you have yarn that you no longer need and would like to donate it to the church, we have a few senior citizens who are knitting hats, scarves and mittens for us to donate to the local schools as part of our Missional Transformation and Outreach project. If you are a knitter or crocheter and would like to help make some items either for our Outreach Project or the craft table at our Christmas Bazaar please speak to Lorraine Whitwell or Colleen. Each month we ask you to provide donations to the food-bank. Of course donations are needed and very welcome at any time. For more information on this program please speak with Al McPhee. A unique partnership of clergy and laity, Faithworks supports the Toronto Diocesan Mission Statement to embody God's love, justice, compassion and liberation in action by seeking and distributing funds from individuals and parishes for the delivery of direct, practical assistance to people in need or at risk in the Diocese. Community ministries supported by Faithworks are located across the Diocese of Toronto and include the David Busby Street Centre and Samaritan House here in Barrie. Faithworks is a living, viable example of how our faith in action can work to bring a better life for those in our community in need. Providing shelter and meals for those in need. Volunteers are urgently needed. For several years, the parishioners of St. Margaret's have shown their compassion and generosity for those less fortunate in our community by providing meals for the "Out of the Cold" program, one evening a month throughout the winter months. Once again this year, we have been asked to participate by preparing and delivering 4 lasagnas to Collier St. United Church, hot and ready to serve, by 5:30 pm. The David Busby Street Centre has a long-standing relationships with other service delivery organizations in Simcoe County and, when not available at the Busby Centre, our team is equipped to advocate for and link participants to the appropriate social services and resources in the larger community. Samaritan House is an ecumenical Ministry offering Christian support services for adults and children. Families who have been affected by poverty or violence are empowered to become self-sufficient through counselling, education and other programs. Samaritan House has a women and children's drop-in, providing clothing and household items, crisis intervention and advocacy, at Burton United Church. Samaritan House also offers computer training, a weekly children's literacy program and assists youth referred by Community and Social Services within the justice system. Future plans include the development of Transitional (Safe) Housing and programs for women and children. Could you help a child improve their reading? 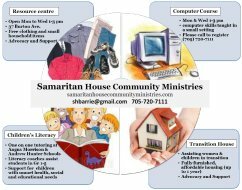 Samaritan House Community Ministries is looking for volunteers to help with their Literacy Program. The commitment is after school one day a week during the regular school year (October to May). If you are interested please contact SHCM at pager 705-720-7111 or email at shbarrie@gmail.com. High school students requiring community hours are most welcome to volunteer. for the Samaritan House Clothing Depot Centre, as well as financial support for the Transitional (Safe) Housing Project. You can drop off donations from 1:00 to 3:00 p.m. on Monday, Tuesday or Wednesday at the SHCM Resourse Centre, in the basement of Burton Ave. United Church at 37 Burton Ave.
For more information, send email to shbarrie@gmail.com or call (705) 720-7111 Location: 37 Burton Avenue, Burton Avenue United Church (lower level). In 2017, we supported one family whose lives had been devastated and if there are any funds remaining they will be used to support additional families. The support is actually in the form of Gift Cards provided by the merchants who support the VISTA program. If you would like to make a donation to the Christmas Cheer fund please put it in an envelope marked "Christmas Cheer" and put it in the collection plate, or hand it in at the church office. All applicants must be known to and referred by one of our parishioners. We will be collecting stamps again for the Leprosy Mission so please bring in your stamps and place them in the jar on the table in front of the office. Yes, your Canadian Tire money would be much appreciated.